How does the chameleon effect work? Watching a movie in the cinema with other people results in enhanced attention. And watching with family members or loved ones increases attention even more. How do we explain this extraordinary effect? And how can you as an advertiser benefit from it? We’d like to share with you the whitepaper ‘‘Monkey See, Monkey Do. How watching entertainment together with people you love increases the impact of advertising” by professor Jelle Demanet, researcher at Profacts and Ghent University associate. In this whitepaper, he takes an objective look at how the chameleon effect works and at how oxytocin affects your brain and your advertising communication. Want to know how much of your ad people actually see? Now you can measure it. How much time do consumers actually spend looking at my ad? As an advertiser, you’ve no doubt often wondered. But how can you actually know how much viewing time your ads actually get? That has simply not been possible. Until now, that is. Together with the research teams at Profacts and Lumen, Brightfish has come up with a way of measuring actual views accurately across a wide variety of media. By using a unique combination of data sets and eye-tracking, it’s now perfectly possible to see whether someone is really looking at a screen. And for how long. With crystal clear statistical data as a result. Where does your commercial profit most? The results are literally eye-catching! In the case of online advertisements, a mere 1.4% of them are, on average, actually viewed. TV fairs a little better, ringing in at 23.1%. Cinema, however, leaps out with a massive 85%. All without distracting our gaze. And we have some more yielding statistics that cannot be overlooked. You can download the research right here. Of course cinemagoers watch more attentively – we hear you thinking – in the dark, from their comfortable seats, etc. But it costs me a lot more as an advertiser. But that is far from the truth! 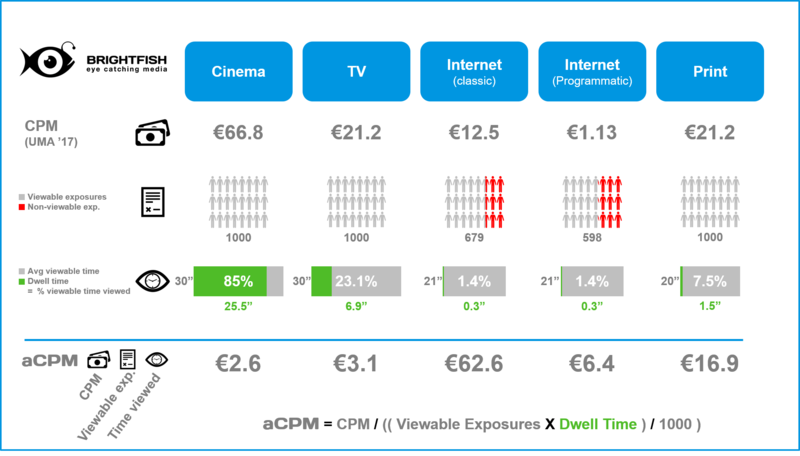 When expressed in terms of actual attention per euro, cinema is actually a lot more cost-effective. Per 1000 contacts at the cinema, 1 second of actual attention costs €2.60. On TV, the amount rises to €3.10 and online up to as much as €62.60! We call it “attention CPM” or aCPM. The cost of 1 second of actual attention per 1000 contacts. Something we explain in detail in our white paper. How much effective attention do I get for my money? Calculate it here! Take the test. It’s easy to compare prices. Simply select your target group and our tool will give you an instant summary of the prices per medium. Even if you get a discount for advertising via a certain channel, we take that into account as well. Do you wish to calculate the aCPM of your specific target group? Contact us! CPM stands for “Coût par Mile” where the M refers to the Roman numeral for Thousand. Cost per thousand, is a standard value used to express a specific Cost to reach 1.000 contacts. aCPM stands for “Attention Cost Per Thousand” or the cost for one second of effective attention per thousand. aCPM is a realistic result of how long an ad is effectively viewed which is measured in cost per thousand per seconds. Eg: For 1.000 contacts in cinema, 1 second of effective attention costs 2,6 euro. Brightfish and you. One to one. The tracking method, the results, the insights and the calculation tool. All explained in meticulous detail.